PanelAbode™ technology is available on all of our insulated cat houses. 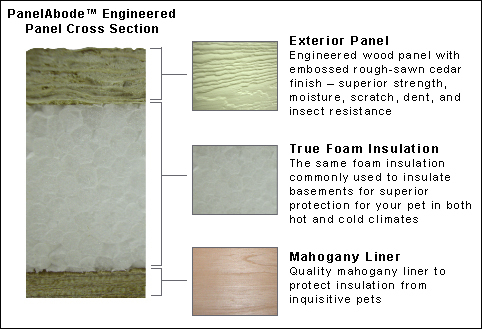 This outer wood panel is laminated to a thick layer of foam insulation and then to a high-grade mahogany liner, creating a 1 1/2 to 2 inch thick (depending on the thickness of the insulation) PanelAbode™ panel. 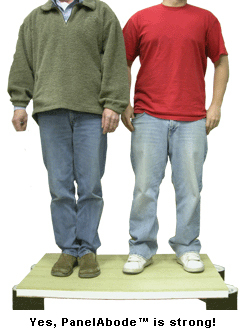 The resulting panel is extremely strong, yet surprisingly light weight. A side panel from our large dog house weighs less than 20 pounds, yet it support more than 400 lbs of weight! Moreover, the lamination creates a panel with far superior structural integrity as compared to other solid wood and even plywood alternatives. If you have any questions about our PanelAbode™ system, please do not hesitate to contact us toll free at 1-877-374-2695.